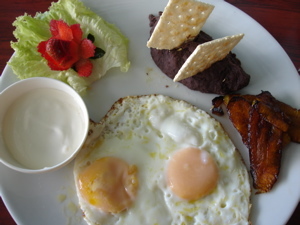 Desayuno Tipico–displayed more artfully than most. 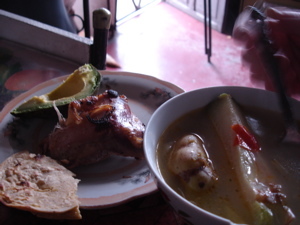 One of the most delicious (and least typically Guatemalan) dishes we sampled. 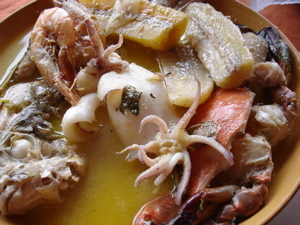 Available only in the Garifuna town of Livingston, the soup is a coconut milk and seafood stock base with a whole fish, crab, shrimp, squid, and plantains served with a spicy green salsa to stir in and doughy buttered rolls. Yum! 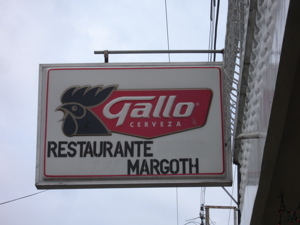 If you go, look for this restaurant. You'll probably see Margoth sitting outside greeting and collecting money. 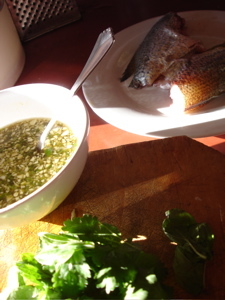 Here's the base for the soup Yolly made us for Christmas lunch. Criollo was a way to separate oneself from the indigenous people and the people of mixed descent to make it much easier to subjugate them. The very best free range chickens are now referred to as criollo. I think they should change the name. 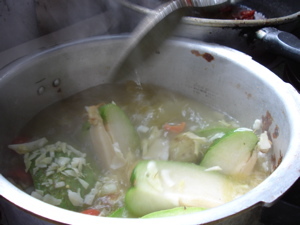 This is how the soup was served. 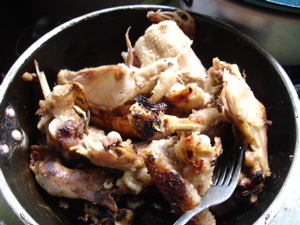 It was really flavorful and satisfying. This was the beginning of the end. The fixins for our last supper. I made Thai food for our hosts and we were all happy to enjoy the usual indigenous ingredients with the flavors of a different cuisine. 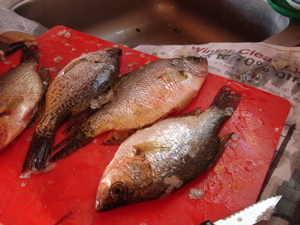 Lake fish. 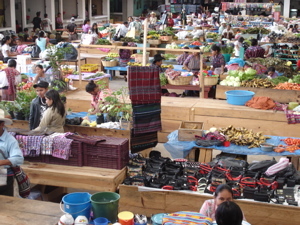 This is the market in Panajachel where we bought the ingredients for our Thai-Guat supper. Everything looks good at sunset on Lake Atitlan. Orange limes. Hmmm. Very confusing for the brain. 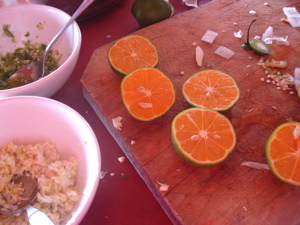 They are every bit as tart as limes and they look like limes and that's because they ARE limes. These photographs are amazing and scrumptious! Thanks for giving a glimpse into a relatively unknown (at least to me) cuisine.